On Friday 20 February 2004, many "front-line refugee defenders" are in the Perth metro area. They're all participants in the UWA Perth International Arts Festival - see the Perth Festival website at www.perthfestival.com.au. Amongst them are Human Rights activist and Barrister Julian Burnside QC, and his partner Kate Durham (co-founder of Spare Rooms for Refugees), United Nations Association of Australia president Margaret Reynolds, Melbourne writer Arnold Zable, Novelist and President of Australians Against Racism Dr Eva Sallis, Kate Reynolds (Upper House member for the South Australian Democrats) and Marianne Dickey (Adviser and refugee researcher for Andrew Bartlett). So far Julian Burnside and Kate Durham, Marianne Dickey, Eva Sallis and Kate Reynolds have confirmed to participate in our planned Swan River Cruise from Perth to Fremantle. Margeret Reynolds may not be able to slot in the afternoon, and while Arnold Zable is only a few blocks away, he's conducting a workshop at the time. Uniting Church worker Rosemary Miller will also try to make some time free to join us. We'll also be inviting Federal ALP's immigration spokesman Stephen Smith and member for Fremantle Dr Carmen Lawrence. 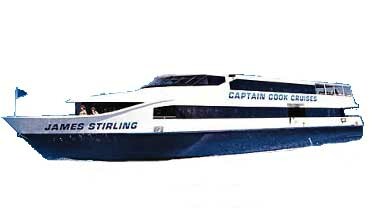 We have arranged for a one-hour "boat cruise" with the luxury Rottnest ferry (Captain Cook Cruises) from the Perth City (Barrack Street Jetty, a 7-minute walk from the Duxton Hotel) to Fremantle on 20 February (boarding 13.30 to sail at 14:00) followed by some refreshments in "A Slice of Heaven" (E-Shed Markets, directly opposite the Boat landing in Fremantle Harbour) at 3:20pm, to return with private cars (provided by volunteers) and taxis if necessary to Barrack Street in Perth, as well as the Duxton hotel, leaving Fremantle at about 16:15, arriving back in the city at around 16:45pm. The cost of the cruise is $16.00 per person, and it would be an opportunity for many people to join - the cruise boat has no problem reserving 40-60 seats for us in a roped-off area - so we can spend some time together for informal chats on board the ferry - as well as over a coffee or so at A Slice of Heaven at Fremantle harbour. 16:30 Departure by private cars and taxis - return to Barrack Street Jetty, The Duxton Hotel, and if required, Winthrop Hall at University of Western Australia. Note: We're still looking for some folks to join us in Fremantle, who are also prepared to return guests who join us at the Barrack Street Jetty to the City at the end of our time at "A Slice of Heaven. Please let Tina and Holly know if you're coming by car and if you're available to transport some folks. 25 February 2005 - Julian Burnside QC: Honesty matters: the ethics of daily life - "The essence of democracy is that the elected representatives are chosen because their constituents think this candidate or that will best represent their views in parliament. If a candidate lies about his or her beliefs and values, the democratic process is compromised. The greater the lie, the greater the damage to the true course of democracy." 19 February 2004: Julian Burnside vs Amanda Vanstone - It was a full house when Julian Burnside QC, one of the most vigorous opponents of mandatory detention, went face to face against Immigration Minister Amanda Vanstone at a Rotary breakfast held at the RACV Club in Melbourne, and directly accused her of crimes against humanity. Kate Durham and BBC reporter Sarah Macdonald "went to the tiny island [of Nauru] posing as tourists and used hidden cameras to record the plight of detainees held as part of the Howard Government's Pacific solution. "It worked because we looked like stupid blondes. We had these little cameras in bumbags around our waists, with sound and everything. We secretly filmed but I was nervous and bad at it..."
24 January 2003: Australia's Pacific Solution: The BBC & Kate Durham undercover on Nauru - Project SafeCom's first ever, and major, screen event, featuring two screenings at the Fremantle Film and TV Institute, with Democrats Senator Andrew Bartlett and ALP Member for Fremantle Dr Carmen Lawrence. The event was attended by almost 200 people. This page is a 'retrospective' assembly of the various pages for the event. Founded by Kate Durham and others, this community-based project is designed to help refugees and asylum seekers find hospitality and welcome in Australia. Spare Rooms for Refugees invites you to register your willingness to house a refugee or refugee family in a house or a flat of your own. :::40 PHOTOS::: 6 May 2007: Kate Durham's SIEVX Art Exhibition goes to Canberra - From 30 March to 15 April 2007, as an art exhibition associated with the Manning Clark House Weekend of Ideas, reknowned Melbourne artist Kate Durham's impressive SIEVX art exhibition visited Canberra at the Theo Notaras Multicultural Centre. Project SafeCom's Jack Smit attended the exhibition's opening. Kate Reynolds MLC is a State Upper House member in the South Australian government for the Australian Democrats. You can read Kate's Parliamentary Speech when she tabled the motion "...that the South Australian parliament condemns mandatory detention and the Pacific Solution as crimes against humanity." 24 October 2003: Kate Reynolds: Motion in condemnation of Australian Refugee Policy - "I hang my head in shame at the treatment of refugees in this country. It is time that the nation's military intelligence resources and actions were directed towards detecting real terrorists, rather than stopping refugees from seeking asylum in our country as is their legal right." Eva Sallis' Novel Mahjar: "Vibrating with life and woven with evocative Arabic fables, these stories are about the differences between Lebanese and Australian culture: between parents and children, new lives and old. With warmth, humour and insight, Sallis's eloquent prose captures the pain as well as the joys of living in a new land." The Australia Is Refugees! Essay Competition project ran during 2002. The project was an initiative of Australians Against Racism - and its President Dr. Eva Sallis of Adelaide University. It was an exceptionally successful schools competition run at primary schools (years 6 and 7) and high schools (years 10-12). Hundreds of children and young adults from all over Australia participated. 23 February 2004: Dark Dreams: Australian Refugee Stories - With editors Sonja Dechian, Heather Millar and Eva Sallis, this is another remarkable book published under auspices of Australians Against Racism. The book is the result of many refugee stories that were submitted for the Australia Is Refugees Essay Competition for young writers in 2003 in primary and secondary schools around Australia. 7 May 2007: Dr Eva Sallis, Australian dream; Australian nightmare: Some thoughts on Multiculturalism and Racism - "...this place is called, with terrible irony, Blackster. It is the other side of town from Baxter, and, although less money is spent here, the echoes are stark, and when I thought about it, almost all generated by the fence." The Dymphna Clark Lecture at the Manning Clark House 6th Weekend of Ideas, "A Fair Go for Refugees?" 10 March 2004: There is No Place Like Home: the 2004 Refugee Story Competition - The 2004 Refugee Story Competition has just been launched by Australians Against Racism. This is an Australia-wide competition. Many schools and individuals will take part. You are invited to submit your essay for judging, and for possible publication! Marianne Dickey is an Advisor and researcher of refugee issues and policy to Democrats' leader Andrew Bartlett, Senator for Queensland. Marianne has the unique position of being one of the very few, if not the only Australian non-parliamentarian refugee defender who has visited the detention centre on Nauru twice. Like Andrew Bartlett, she is a longstanding Project SafeCom supporter. 27 February 2008: The Senate debates Australia's 'Excision Zone' - There's no reason in 2008 for anyone in Labor to argue that the issue of John Howard's extraordinary excision zone 'has not been discussed'. When the former government pushed through changes to that exclusion zone for refugees in 2005, Labor supported a Disallowance motion put by Democrats Senator Andrew Bartlett. 26 November 2003: Andrew Bartlett's October 2003 SIEV X Senate Motion - Speech in the Senate accompanying the Motion of Condolance for the victims of SIEVX. "...that the Senate ... calls on the Commonwealth Government to immediately establish a comprehensive, independent judicial inquiry into all aspects of the People Smuggling Disruption Program..."